Digibit Aria Wamp streamer and media centre to make UK debuts this summer | What Hi-Fi? The Wamp turns your passive speakers into a wireless music streaming system, while the Aria MC is an all-in-one media centre. The Aria Wamp will be available in two versions: a 2 x 50w all-in-one stereo model for £1790, and a 2 x 100W monobloc version for £2500/pair. The latter consists of a pair of Class D monobloc amplifiers, each designed as a slim plinth that can act as a support for a pair of floorstanding speakers. In effect, this converts any passive speaker into an active wireless hi-fi system. Users can stream music via AirPlay to the amps in up to 24-bit/48kHz quality, or via wi-fi in up to 24-bit/192kHz. There is also Bluetooth 4.0, DLNA (Digital Living Network Alliance) and wired or wireless LAN support. Digital-to-analogue conversion is handled by the built-in 32-bit/384kHz and DSD (Direct Stream Digital) 64/128/256-compatible DACs. 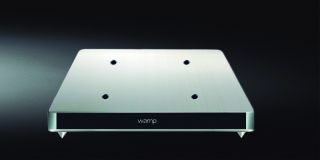 For those who don't have room for two monoblocs and floorstanding speakers, there's also a bookshelf version of the Wamp for use with standmount speakers. Both models support gapless playback and can be controlled using free iOS and Android apps. Also new from Digibit is the Aria Media Centre (MC) which can stream audio, video and pictures from the internet, a PC/Mac and iOS or Android smartphones and tablets. It costs £999 and includes a 2TB hard drive. Wireless connectivity includes Bluetooth 4.0, AirPlay and DLNA. And additional components such as a Blu-ray player or home cinema amp can be connected via HDMI. The Aria MC supports high-resolution PCM (Pulse Code Modulation) audio up to 32-bit/384kHz and DSD 64/128/256 in both stereo and multichannel formats.